This covetable ocean view Sydney home designed by Space Control has the cool factor. One of it’s draw card features is the stunning kitchen detailed with v-groove polar white curved island and back bench, along with American Walnut veneer full height cabinets, detailed by a solid walnut trim., brought to life by Bondi Kitchens. Sublime ink-blue veined ’Calacatta Statuario’ is featured throughout the project, with the striking Artedomus ’Smetaldo’’ green quartzite for the bar. 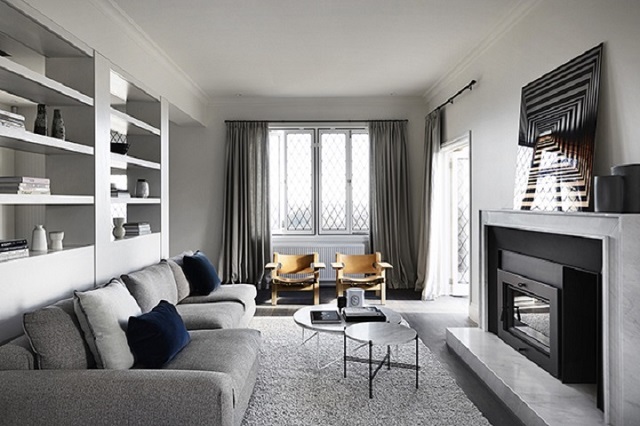 The brief was to bring this Coogee beach house to its maximum potential as it was in desperate need of a complete makeover and to introduce a sense of a playful contemporary style to the interiors that related to the client’s beach lifestyle. Do you have a favourite room? The first floor living (parent’s retreat) I like the open planning living that is focused around the marble fireplace along with the feature American Walnut and brass bar for entertaining. The house has amazing natural light and this space captures it beautifully. What were your design objectives for the project? To create a house that had a strong design direction but was still a liveable family home – not too perfect. Where the kids could come directly from the beach and feel relaxed to use the features and furniture in the house. Solid American Walnut Timber joinery is combined with a minimalist white colour palette that contributes to the laid back coastal atmosphere created within the home. How would you describe the style of the home? The Coogee beach house is richly layered with numerous bespoke interior elements that add fun, joy and intrigue, whilst the design creates a new visual language for the family home. Freedom's new Autumn Kitchen Collection has launches and it's turning heads - it's packed with creative ideas to transform your kitchen and make it a place you want to spend time in. They offer endless inspiration through a range of displays, styles and colour choice and they have something for everyone's taste, style and budget! Andy & Ben from The Block have created a modern kitchen with an Art Deco twist fitting the heritage of the building. 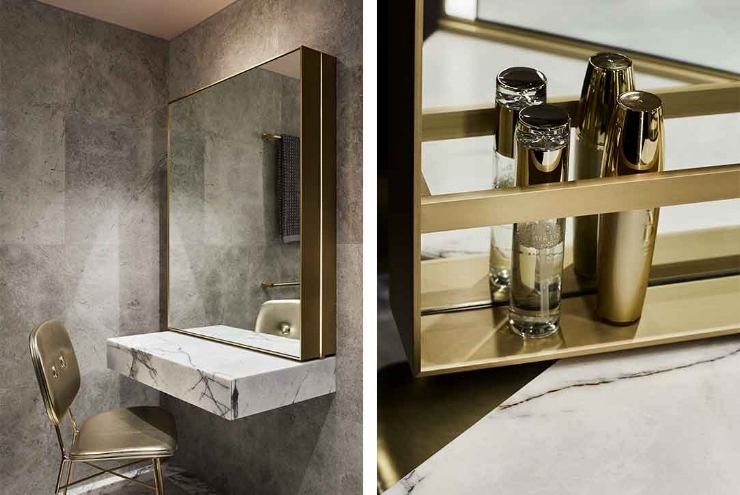 Colour and texture have been used in interesting and refreshing ways to celebrate Art Deco whilst keeping clean contemporary lines. Top cabinets in Black Riven have been offset to create interest and play on the Deco style and have been paired with Newbury Baye and Bayleaf creating a fresh colour palette. An entertainer’s dream, the design features ample storage throughout both the kitchen and sizable butler’s pantry, chic NEFF appliances and stunning Caesarstone ® Fresh Concrete benchtops. Black is the new white in kitchens – it’s the perfect way to put a modern spin on a traditional Shaker-style design. The Sierra cabinets in Matt Black, Caesarstone ® benchtops in Pure White and gold highlights gives a luxe look and contemporary feel without adding a high-end price tag. 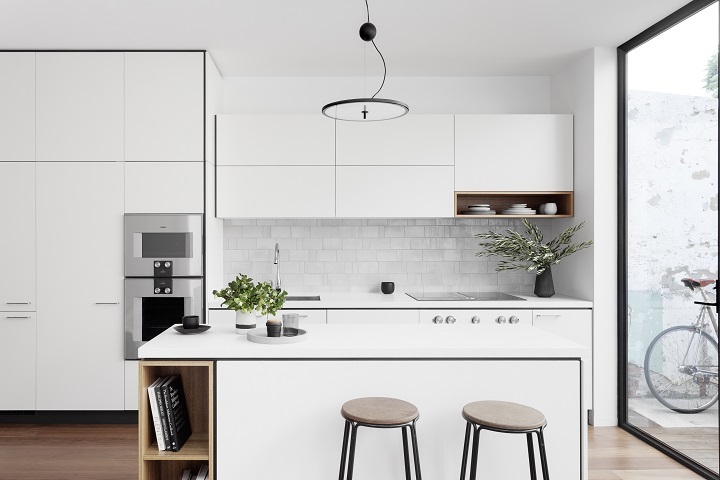 Designed for a Melbourne family of four, this kitchen needed to be as functional as it is beautiful. The supersized island bench offers plenty of seating, storage, a place for appliances as well as a secret hiding zone for the two young boys of the house with the centre of the island! A butler’s pantry and laundry adds additional storage and workspace to this busy kitchen.